One of the more direct parallels between George R.R. Martin’s characters and historical cultures is that of the Ironborn and Vikings. Theon Greyjoy spent his formative years away from Pyke, in a foreign land amongst a society that could not be more different from the Ironborn. The Ironborn are fiercely proud of their heritage, they cling to the belief in the Old Way, where a man’s worth was judged primarily on his skill as a raider. The Ironborn disparage the men of the ‘green lands’. It is difficult to say whether Theon, who had been brought up on the privileged side of the feudal society in Westeros, could ever truly have adapted to life back on Pyke. 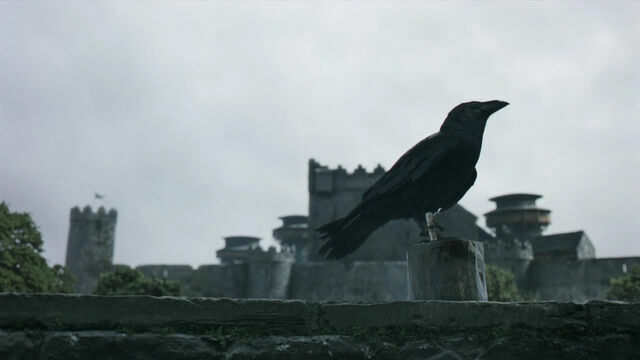 Could Theon really have fitted in amongst the Ironborn, born in a harsh, bleak land that valued warfare above all? Today we are joined by historian Ian Stephenson, author of Vikings! and a specialist in Roman and Early Medieval warfare, to discuss Theon, the Ironborn and the Viking warrior. [Olga Hughes:] Do you think the similarities between the Ironborn and Vikings are based more on their culture or warfare? [Ian Stephenson:] The quote reminds me of that archetypal Viking, Noggin the Nog – “In the lands of the North where the black rocks stand guard against the cold sea, in the dark nights that are very long…..” I’m being slightly tongue in cheek here, as I don’t think Noggin ever killed anyone – so not quite your archetypal Viking! But the lure of the North is strong and if you are creating a medieval world then some sort of seaborne barbarian is, I suspect, hard to resist. Of course nothing is ever straight forward, and fiction has the luxury of picking and choosing what it wants — and why not? So are the Ironborn Vikings in cultural or military terms? Well probably both and neither! Raiding and terror are very much a part of warfare, from the ancient to the modern, so just as we see Romans on the column of Marcus Aurelius taking heads and sacking villages, so in the First World War trench raids were seen as dominating the enemy and controlling no-man’s land. In a medieval context we have the chevauchee and the seaborne raid. Don’t forget, it was quicker and easier to travel by water — the seas and rivers were the great highways of their day, and the earliest Viking ships were as much designed for raiding as for the transport of goods and spoils. Plus, for the peasant- working class, life was harsh and dangerous until comparatively recently — probably post Second World War. The lower echelons of medieval society would, I suspect, have found it depressingly grim. Of course, in fiction you can have all levels of society taking up arms for various reasons; in reality the social (and therefore military) elite were very careful about who could fight. The Peasant’s Revolt was deeply unsettling to the ruling class, as are all such risings, because it threatened the perceived order of society from God in Heaven, through to the king and the lords etc. The right to bear arms and wage war isn’t for everyone. Society was very much divided into those who fight; those who pray and those who work – and this last group represented the majority of the population. It is only later, as armies become larger and larger, along with the advent of mass gun powder weapons, that we see the increasing use of the working class in armies, but their ability to rise in rank is still constrained – the purchase of commissions in the British Army was only abolished in the 19th century. This may seem a long way away from the Vikings and the Ironborn, but in the end fiction has a freedom which real life does not. Thus, although they share similarities, (it would be surprising if they didn’t) Viking society was more stratified. The ‘nation in arms’ is a product of the French Revolution; and the right of all free men to bear arms and turn out and defend Ye Olde England owes more to Victorian romanticism than historic precedent. [Olga Hughes:] How important was the ideal of “Warrior” in Viking culture? [Ian Stephenson:] It is easy to become enamoured of the “cult of the warrior” in the early medieval period. In physical archaeological terms we look at the “bright wargear”; the comb and personal grooming kits; the exotic belt fittings from the East; the gold, the garnets; the silks and fine wools that survive as fragments. In cultural terms we have Cnut portrayed as the great king; the Christian King, Alfred is depicted as biblical King David. On top of that we have the great poems of the age such as Maldon, Finnsburg, and, of course, Beowulf. If Maldon promotes the ideal of dying with — and for — one’s lord, the Finnsburg (the fragment and the episode) may be seen as part of the foundation myth for the beginnings of Anglo-Saxon England. While Beowulf paints a picture of the ideal warrior – loyal to his lord, fearless even in old age, a shield to his people — warrior cultures do idealise themselves — and I am not so cynical a post-modern as to entirely disbelieve the propaganda. However; at the end of the day many (most?) of these people were thugs, who preferred the hunt and the cup to the poem and the lyre. Within this, there was the need to do, say and behave the right way. People who are a part of the club; the clique; the society; generally wish to stay there. Particularly if that makes them part of the elite. Even when you are ‘at the bottom of the top’ so to speak, still by your deeds and actions you had a chance of upward mobility. By contrast, a peasant farmer would remain a peasant farmer, no matter what. The Anglo-Saxon poem The Wanderer speaks of one who is now lord-less, and it is filled with despair and sadness. To have been part of a warrior society only to then find oneself cast out, would have been a cruel loss, keenly felt. Societies have mores and these needed to be followed. A lot of the warriors who sat at the mead bench were there to fight, to execute their lord’s will, collect and render taxes and defend the people who their lord protected. But equally they participated in the culture of their day; they listened to the poems and the stories, they dressed in a certain way, their hair, beards, moustaches were all a certain way, they enjoyed the hunting/drinking and they wanted to gain land; a wife etc. But for all the conforming and fitting in, really they were no more than echoes of the great archetype – Achilles – killers of men; that was their purpose. But the cult and its culture remain glamorous. [Olga Hughes:] Balon suffered a crushing defeat during the Greyjoy Rebellion, he was forced to surrender, his two eldest sons were killed, and his last surviving son, Theon, was made a ward of House Stark as hostage. This would obviously have a psychological impact on anyone but in a culture that supports the Warrior elite, how would their leader’s defeat impact a community as a whole? [Ian Stephenson:] Tolkien’s view of kingship has been commented upon as being very medieval, in that the land and the king are one. Theoden is undoubtedly the exemplar, but Thorin equally makes a poor start as king under the mountain. However, both they and their kingdoms are saved by their subsequent noble deeds and glorious deaths in battle. But this is fiction – real life is more complicated. There are taxes and laws, plagues, poor weather and the consequent failures of harvest — C.S. Lewis alludes to this at the end of my personal favourite The Horse and his Boy. However, Tolkien is not wrong. The land and the king are one, because in the end kingship is martial, the king’s primary role is as the Anglo-Saxon’s described it to be “the shield of his people”. Tolkien — equally elegant — states that “a king is he that can hold his own, or else his title is vain” (The Silmarillion). An argument can be made that Harold rushed to Hastings because William was ravaging the land of Harold’s patrimony; his family’s tenants were suffering the depredations of a foreign invader and Harold was failing in his primary duty as lord to protect his own. Weak leadership, failed leadership — or the perception of either — can have results, dependent on the cause of the weakness or failure. Genuinely weak leaders such as Aethelred II “the Unready”, Richard II, Henry VI are all examples of frail leadership. Here we see the rise of factions and the rule of favourites; central authority weakens and the rule of law becomes arbitrary – dependent upon who you know, not what you did. Uncertainty prevails. Civil war is a potential consequence of weak rulership, certainly the end of the Plantagenet kings stemmed from weak central authority under Henry VI, and a belief that various members of an over-large family had a better right to the throne than the current incumbent, culminating in the usurpation of Richard of Gloucester and his defeat at the hands of Henry Tudor – someone who really should never have come anywhere near the throne. It was Henry VII who reaped the rewards of the Wars of the Roses, but if the rightful king, Edward V had remained on the throne, then ….…. well that is a whole world of “what ifs?”! Certainly strong kingship does not mean tyranny — Henry V being a good example of this. A strong king can keep his nobles in line; exact and keep the law. Taxes have to be raised, of course, but for the common weal there is stability and peace, and the prospect of wars being foreign wars (which are always more favourably viewed than domestic ones!) Defeat in war can of course lead to death or exile; alternatively it can lead to subjugation and/or the dismemberment of the state. In the case of Balon, we see a polity that has been reduced in status along with its ruler. Power resides elsewhere. When the Vikings removed Burgred king of Mercia, they put in his place Ceolwulf, a puppet – remembered to history as a “foolish king’s thegn”. Was Balon a puppet? Certainly, he was no longer his own master. He was also a failure – he had failed in war and he had failed to protect his people. He was subject to others and their policies, holding his position in suffrage – and in real life that would have been made obvious. As time passed, this hinterland culture would have been changed to become more like that of the centre — that of the victor’s. History is unforgiving — losing cultures generally disappear. In the process, laws view the losers as second class. Their rights are curtailed, their lands and lordships given to the rule of others. Even if one of their own remains as “lord” it is generally to ease the transition. Once the “Game” started again following the death of Robert Baratheon, he would be viewed equivocally by his lords, and despite calling himself king, he only does so as a result of the weakness of the political position on the mainland. The fact that the events take place in the space of less than a generation mitigate the effects of his failed rebellion, but equally subsequent events — the Ironborn’s success is against weak opponents — and the squabbles over the succession show the results of Balon’s weakness, both perceived and actual. There is no real challenge in the North by Balon; he is chancing his hand hoping that whomsoever wins in the South lacks the strength to crush his nascent kingdom and his support amongst his nobles is based upon this shared belief. His “accident” if that is what it was, means that he would have avoided the price the failure should his beliefs prove unfounded, as indeed they are likely to. Equally, his lack of a definite heir means the succession is up for grabs, and (as with Richard III and Henry Tudor) failure by the new king of the Ironborn would leave everything up in the air, with people scrambling for power and position – The events of AD69 showed that emperors were not necessarily made in Rome! Martial lordship is based upon success and strength, as well as the driving force of personality. Failure in these areas leads to the withdrawal of support or at least to equivocation — the behaviour of the Stanleys at Bosworth being a good example of the latter turning into the former! [Olga Hughes:] What are the differences between the Viking ideal of warrior and the medieval ideal of chivalry? [Ian Stephenson:] In my opinion, chivalry was battlefield-insurance for the nobility! There is a scene in the very first episode of Blackadder where Edmund is asked by his brother who he killed at Bosworth. He obligingly lists various nobles and churchmen, then, in the event of a tie, he is asked how many peasants he killed. I cannot remember what he said, but a number in the thousands sticks in my mind — the point of this being that peasants don’t count — you can kill as many as you like! Although this sounds a bit flippant, by and large, it remains true. Chivalry was developed by the nobility for the nobility. At Agincourt, Henry V, worried that in the midst of victory he would be overwhelmed by the French third line in conjunction with the mass of French prisoners, orders the execution of the prisoners. This grimly pragmatic decision was viewed as shockingly unchivalrous. To ensure that the deed is done, the King orders a company of archers to execute ( !) his will. Why? Well, the archers were neither bound by, nor protected by chivalry. They had nothing to lose and (in winning and staying alive), everything to gain. Really, the difference between the Viking ideal of warrior and the medieval ideal of chivalry isn’t a question of poetry — skald versus troubadour — or the rise of jousting, with full plate armour replacing mail and Grail quests. It is a question of what happens on the battlefield. Warfare pre-chivalry was brutal. Let us not forget that Harold II was first hit by an arrow and then hacked to death; nor that Oswald, king of Northumbria, was dismembered following defeat and death in battle! Whilst generally battle is no respecter of social status, the nobility in the later medieval period, despite being trained from childhood to face their social equals in combat, wanted to survive. Chivalry and ransom provided an honourable way out — something that had not existed before. The idea was you could fight your social equal, thus reaching the pinnacle of your existence, but if things went wrong you could avoid death by submitting and offering ransom. King John II of France was captured at Poitiers and offered ransom — in an earlier age he may well have suffered the fate of Oswald or Harold. Civil wars, such as the Wars of the Roses, were different. Here chivalry goes out of the window — control of the kingdom is up for grabs, so the niceties are set aside and the mores of an earlier age are resurrected — with the corresponding death toll amongst the aristocracy bearing grim witness to the fact that chivalry was, even at its zenith, very much reliant upon the circumstances of the conflict. [Olga Hughes:] Can you tell us about the aspects of the “Complete Warrior”? [Ian Stephenson:] Our picture of the “complete warrior” stems in the main from two things: grave goods and heriots. Grave goods are fairly self-explanatory — they are the artefacts buried with the dead as part of the burial ritual. That’s the easy part — the hard part is explaining why; not simply why were they buried but why you get different combinations, and was anything done to them as a part of the burial ritual. Heriots are a feature of the late Anglo-Saxon period and are probably best described as death duty payable in wargear to a man’s lord; with the exact amount of wargear being dependent upon the rank (within the warrior elite) of the deceased. As with grave goods, the question is: how do we interpret the evidence from these sources? Along with written and representational sources, historians and archaeologists have reconstructed the arms and armour of the warrior class in the Viking and Anglo-Saxon periods. In the process, some members of the elite group appear to have come out considerably better equipped than others. Whilst in general terms there is nothing wrong with this, we might expect kings to be better equipped than say a young warrior in a lord’s following. I would argue that both would be equipped with practicable weapons sets – but that is not always the case with some interpretations of the evidence! Thus from grave goods, we get everything from a single spear through to Sutton Hoo Mound 1 with its mail, helmet, shield, sword, axe, and multiple spears! The same holds good with heriots. A king’s thegn was expected to supply 2 horses (1 saddled, 1 unsaddled); 1 sword; 2 spears and 2 shields. An earl was required to supply 8 horses (4 saddled, 4 unsaddled); 4 helmets; 4 mail shirts; 4 swords; 8 spears and 8 shields. Now in basic terms, this is all to do with the relative wealth of the individuals concerned. The presence of single weapons in burials might simply be interpreted as showing the right to bear arms – not necessarily the sum total of what was carried into battle. In terms of warfare and viable weapons sets, these (particularly in the case of heriots), have been turned into what I view as unviable warriors. Thus if we take the earl’s heriot, this has been seen as providing equipment for 8 warriors, half of whom are minimally armed (spear and shield only) and have horses without saddles! The key with heriots is the number of swords – this gives you the number of sets of wargear. Horses, shields and spears are all spares — you need them; they get broken! Armour and helmets are desirable, but not necessities. What you need for a viable set of equipment – for the complete warrior – is a shield, spear; sword/axe – thus you can defend yourself (shield), kill from a distance (spear) and kill at close quarters (sword or axe). Anything less will lead to morale failure, anything more (armour/javelins/bow) is a bonus but not strictly necessary. This minimum set of shield/spear/sword can be seen right through the history of Western warfare from the rise of the hoplite through to the inception of plate armour at the end of the medieval period. One final point that should be considered is so-called parade armour. At times, items that survive from the Viking period (and indeed the Roman and Anglo-Saxon periods) are designated as “for parade or display”. I don’t believe this to be true and, see it more as a modern interpretation in an age of khaki! Weapons and armour were at times beautifully decorated as marks of status and, fashion — and to project an image of martial terror on the battlefield. Looking fabulous in battle was a feature of warfare right up until the mid-late 19th century — in some countries even up until the First World War. In the Viking age you wanted to look your best when you went into battle! Your sword with the gold hilt was your best sword with the best blade, you didn’t leave it behind! The same goes for decorated shields, decorated spearheads, helmets — indeed all of your gold and silver decorated wargear! [Olga Hughes:] Many of the cultural and technological aspects of Westeros seem fixed, stagnant. The Ironborn in particular seem determined to cling to their ‘Old Way’, regardless of the consequences. Can you tell us how the Vikings actually adapted their warfare over the centuries? Of course every age re-writes Arthur, but artillery at Camlann is pure genius, such an acknowledgement of change is unusual to say the least. People tend to ignore the fact that the English deployed cannon at Crecy in 1346 — less than 300 years after Hastings — and whilst you can argue that the civilisations of central and South America were at the level of the Bronze Age when encountered by the Conquistadors, the fact remains that works such as A Song of Fire and Ice are indeed stagnant. The authors of such fictions provide histories stretching back thousands of years in a never-ending European Medieval period. Thus we see plate armour and crossbows in such fiction, but we do not see the changes and adaptations which are so obviously a factor of – indeed a successful feature of — the rise of the West. Thus we do not see landskneckts and pike blocks, gunpowder weapons and the rise of the armies of the modern period. The Vikings of course fit into the Western tradition of change, adaptation and development. There are a number of ways in which the Vikings changed over time, some technological, some organisational. In technological terms we see the development of the longship, the earliest examples such as Gokstad and Oseberg were more general purpose (both warship and transport vessel) than the sleek pure warships, such as Roskilde 6, that we see in the later period. Thus over time we see a range of Viking ships arise with different functions — trading vessels and warships — rather than the earlier more multi-purpose vessels. On land the development of the two-handed, long-shafted, broad axe may well have been designed as a way of breaking the shield-wall and for dealing with the rise of mailed cavalry. Equally, over time we see an increase in the levels of body armour and helmets available, and these are the result of increasing wealth and the rise of states. This is an aspect of the organisational change I mentioned, for over time we see the early raids of one or two ships turn into large forces, as groups come together and the benefits of larger forces becomes apparent. The Great Raiding Army of AD865, which so nearly ended the kingdoms of Anglo-Saxon England, was such a force. The Oseberg longship (From the Viking Ship Museum, Oslo, Norway). Image: Arnejohs on Wikipedia. Licensed via Creative Commons. Again, in time we see change in the growing power of the state in Scandinavia, and in the second Viking Age we see royal armies with the invasions of 1013 and 1066 by Swein of Denmark and Harald of Norway. These are royal armies, intent on conquest and not the simple lord-with-a- warship, intent on a quick raid that we saw in AD793. Both technological and organisational change are apparent in the exploits of one of the most successful Vikings of the period and his descendants, namely Rollo of Normandy. The Vikings who became the Normans embraced the latest in European technology, mounted warfare, and crossbows, along with the latest in European organisation -castles and feudalism. The result? William the Bastards conquest of England in 1066 and the Norman conquest of Sicily. The Vikings like all successful civilisations changed and adapted over time. [Olga Hughes:] You discuss ofermod as being a virtue in an aristocratic warrior milieu rather than the fault it is usually portrayed as. But do you think it was Theon’s pride that led to his downfall? [Ian Stephenson:] Dithering, uncertain leadership gets people killed. Men do not have confidence in such leadership – the very first episode of Band of Brothers makes that very clear — if you’ve never seen the series I would definitely recommend it. That’s not to say that all confident, gung-ho leaders are perfect. Custer & Ludendorff, to name but two, are good examples of pride leading to catastrophe. Theon fits into this category. Military leadership requires pride. It requires the projection of confidence and the belief that what is being done is right. It requires a certain, if not coldness, then the ability to send people to their death. It also requires experience, understanding and knowledge and some leaders (and here we are back to Custer, Ludendorff and Theon), were promoted well beyond their ability. Ofermod (over weening pride as it is sometimes translated) is indeed a military virtue, Scipio, Nelson, Caesar, Alexander, Napoleon, Wellington, Montgomery — all of the great captains — had it. That doesn’t mean they didn’t make mistakes, but their pride was tempered by experience. Byrhtnoth at Maldon has been unfairly criticised – the argument goes that his pride led him to recklessness – but up until the moment of his death, everything was going right for him and militarily his decisions can’t be questioned. The criticism comes from hindsight after the result, rather than from an objective assessment of the situation. All images from the show Game of Thrones are copyright HBO. “Noggin the Nog” – that takes me back; Noggin interacted with an ice dragon in one series, a much more kindly sort of dragon than Drogon though. Then there was Pongo, the baby dragon who was the queen’s pet in the “Rubovian Legends”. And of course the Clangers had the soup dragon and more recently there was “Jane and the Dragon”. But enough of nostalgia for children’s TV cartoons as I’m getting off topic. I was going to head over to a history message board I sometimes frequent to get the reference for a Viking stone that had some designs that were closely akin to Celtic knotwork. I had not realised until quite recently that there was some overlap. I see however that the Middleton cross, a photograph of which illustrates the above article contains such a design. I suppose my idea of the Vikings tends to be a stereotypical one, but having read the above, it makes sense that the Vikings of the eleventh century would be more advanced than the first wave of Vikings. As with other books I have come across on this blog, “Vikings!” will have to go on my continually expanding “to read” list. Watcher, I agree. The Vikings were way more sophisticated than I would have imaged from their popular image. One thing I learned — I believe from Ian’s book — was that the Vikings were extremely sophisticated in terms of technology. For example, I think they excelled at steel production (swords) and certainly boat construction. The longboat was quite innovative and superior in terms of design — and it gave them major strategic advantages. E.g., the longboat was a seafaring ship that could go all the way up the rivers to places in England they raided. Having a draft that was shallow enough to sail up rivers caught the settlements they raided off guard. I can’t exactly remember the details but I went to a talk (relating to the history of Cannock Chase, a beauty spot in Staffordshire). The talk was many, many years ago but I seem to remember the speaker saying something about a type of glass having been found in the vicinity that was not common in Staffordshire but it was known in Yorkshire. They had postulated that it had been brought to Staffordshire by Vikings via the Humber estuary [into which the River Trent empties] and then up the River Trent (the Trent is the second longest river in England but it rises in Staffordshire near Stoke-on-Trent). Of course compared to the Mississippi and the Danube for example any British rivers are small potatoes but Staffordshire is pretty far inland. So yes, seems they did get about on those boats of theirs. Wow. that’s pretty amazing actually. I didn’t realize they went that far inland. Thanks to so much to Ian for that interview. I have Nordic ancestry through Scotland and Normandy, areas where the Norse settled and adapted. When I was in grade school, in the ’50’s, we were taught that Vikings were no more than thieves and thugs. Just over the last few decades have scholars set the record straight. It is a proud heritage. Cal, thank you for the delightful comment. I’m going to shoot Ian an email to make sure he sees your comment, Watcher’s, and the last comment that came in this afternoon. I’m not an expert in the Vikings/Norse by any means, but I agree. When I began doing research about them for the Yara and Theon articles, I was amazed by Norse accomplishments and the sophistication of their culture. Often it seems like the technological innovations of the Norse (longboat construction, skill with wood and steel), (some) relative equality towards exceptional women, and fascinating social and justice system aren’t widely known by the general public. I learned quite a lot reading Ian’s excellent book actually. Cal, did you ever get a chance to see the BBC documentary series about the Normans from 2010? Forgive me if I’m sticking my beak in but I wondered if it would have been of interest to you if you have Norman ancestry. Some BBC shows get on to the PBS networks in America I believe. I think the presenter was a Professor Bartlett but couldn’t check because it seems like the proverbial gremlins have been at my computer and the screen tends to flicker in some applications. There might be some excerpts on YouTube though I’m not sure if they are supposed to be there. Some of the Normans do seem to have been very violent. I’m not saying they made Ramsay Bolton look like a fluffy bunny, but they could be on a par with him. I can’t remember exactly but there was something about somebody going to a wedding and getting the Theon treatment, being deprived of their sight and I’m sure there was something else as well. The man survived and became a monk. There’s been something in the British news in the last few days about a treasure hunter having found a significant Viking hoard in Scotland. Watcher, is it this discovery here? That is the discovery referred, Jaime. I don’t go out with a metal detector but if I ever come across any discarded metal in my daily life it is usually a rusty canister (for baked beans etc). In his/her post Anonymous had made some valid points about the Ironborn. Some people who were book readers before they were show watchers seem to feel that the Ironborn have been made less fearsome in the show, but they don’t seem to win much in the final analysis in the books either (well, I guess they took Moat Caitlin until they were tricked out of it). A little bit off-topic, but perhaps slightly linked in that the Normans were descended from the North Men, today is 948 years and one day after the Battle of Hastings (from whence the Norman Conquest of England is dated). Oh wow! Great observation about the anniversary of the Battle of Hastings, Watcher. This is a superb article, but I still think that Ian was too kind on Balon, even in light of him being a defeated Lord trying to prove he could still conquer. I find that the Ironborn feel distinctly “tacked on” by GRRM compared to other cultures in Westeros like the Dornish who seem more organic, and it has something to do with the anachronism of having a resurgent “Viking” nation within a coalition of Kingdoms based on the late middle ages (gun powder not withstanding). The type of raids which Balon Greyjoy and the other Ironborn look back on fondly are reminiscent of the Viking raids in the eight, ninth and tenth centuries, where they were, I acknowledge, the scourge of European coasts. However, by the time large, centralized Kingdoms had become fully formed in Europe (which they demonstrably had in the 7 Kingdoms as well, even before Aegon the Conqueror) these raids were on the decline, because the Scandinavian countries which propagated them were becoming Christian and centralizing themselves. My point is, it feels a little artificial that after 280 odd years of subjugation, “the old way” has never relaxed its grip on the Ironborn imagination, and every Lord who has sat on the Seastone chair was simply biding his time before he could raid with conviction again. After re-reading the books, I struggle to seem them as anything other than a “Viking-Ex-Machina” to doom the Stark cause. Balon is indicative of this; whilst his plan looks relatively good on paper – “attack the North during Robb and his army’s absence, seize major choke points, claim the North and prove that I’m a conqueror after all” – the whole thing collapses when examined in regard to the political and geographical realities of the story. As only Asha seems to be aware, the Ironborn cannot hold the North; it’s just too big. The equivalent would be any “Viking” Kingdom trying to seize the medieval Rus. The actual impact of Balon”s invasion is only really felt when Theon seizes Winterfell and “kills” Bran and Rickon, an event which Balon did not plan for and had no part in. Otherwise the only significant conquest of the Ironborn was Moat Cailen, which all but ensured that unless Robb’s army was completely destroyed (an unlikely event at the time of Balon’s invasion, which began at the high water mark of Robb’s cause) he was committed to war to the knife with the Northmen in perpetuity – and the North has more men and knows the land. Considering how badly Balon misjudged the political situation the last time he rebelled (thinking that Robert lacked the loyalty of his new vassals to quash Ironborn independence, when in actuality it provided a much needed rallying point for the fledgling monarchy) his understanding of the War of the five Kings was just as terrible this time. In a situation where only one faction wants the same thing as him – namely, independence – he attacks that very faction, and offers an alliance with the status quo only after he’s fully committed to the war. That Balon had the credibility to pull this sketchy inavsion off without any real promise of loot or plunder is… difficult to swallow. I realize Asha and her Uncle the Reader dissagreed, but Balon had already proven to be incapable of protecting his people nine years before – surely more of his countrymen would have had doubts about this insane plan? This is a very astute and erudite comment. Thank you for sharing. As much as I hate to criticize GRRM, I think you make some good points. From his perspective, I suspect that he’d justify the longing for the old ways by saying that it is fantasy and he is choosing the elements of the culture he likes or that he feels work with his story. However, I suspect potential “anachronisms” or discontinuities would grate for the informed. However, Vikings actually ~ruled~ Rus for a couple of hundred years !